WHAT IS THE RATIONALIZATION PLAN (RAT PLAN)? HOW WILL THE RAT PLAN IMPACT THE ORGANIZATION? WHO ARE INCLUDED IN THE RAT PLAN? WHAT DOES IT MEAN TO BE AFFECTED? 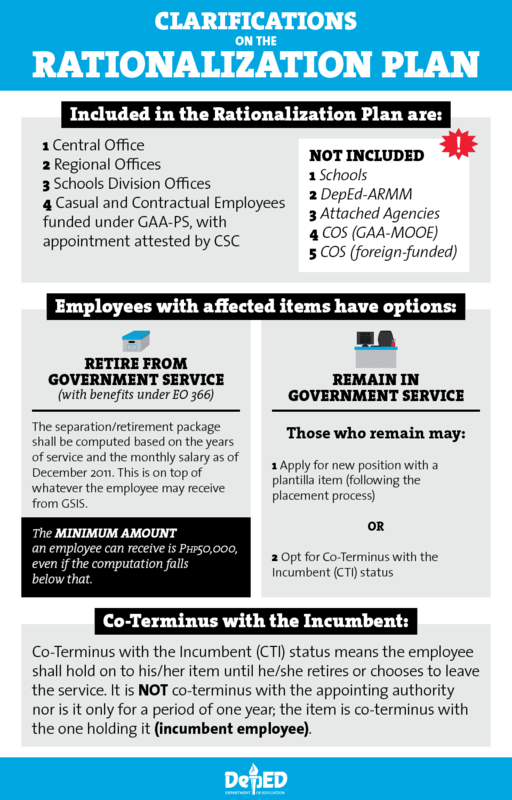 WHAT ARE THE OPTIONS FOR AFFECTED EMPLOYEES? It means they can choose to hold on to their item until they choose to retire, resign, or get appointed to another position. They will be assigned to where their services and skills are needed. No one will lose their rank or position level. No one will be forced to retire. It is voluntary.